Really? I just couldn’t believe that Nicky would spend all her time and energy coming out with something that was pure junk. So I checked out a copy of the book through my local library to see if this book was truly filled with ‘ugly’ designs. Well, guess what? I absolutely LOVE this book. Nicky, you are incredible! No, this is not a book for everyday knitting. This is pure knitting fashion! Nicky takes knitting to a whole new level in a way that is daring and whimsical at the same time. Inspired by knitting traditions around the world Nicky Epstein has shown herself to be the Elsa Schiaparelli of the knitting world. Knowing how traditional wool tams are made, I adored her larger than life Fair Isle Tam Capelet. Her Fiesta Skirt makes me think of the art and craft fairs in Santa Fe. And the Evening Gala Aran with its ostrich feather collar makes me want to finally learn how to knit cables. The one piece that’s really got my hands itching to knit is the La Belle Cardigan. Only Nicky could make me fall in love with something so pink and frilly. “Knitting On Top of the World is not for the knitter who wants to blend in. These designs are meant for the knitter with the desire to stand out and be noticed. With this book Nicky Epstein has shown that she’s not just another knitter who designs pretty cardigans, but an artist who uses knitting as her medium. I picked up another gem from the library this week. 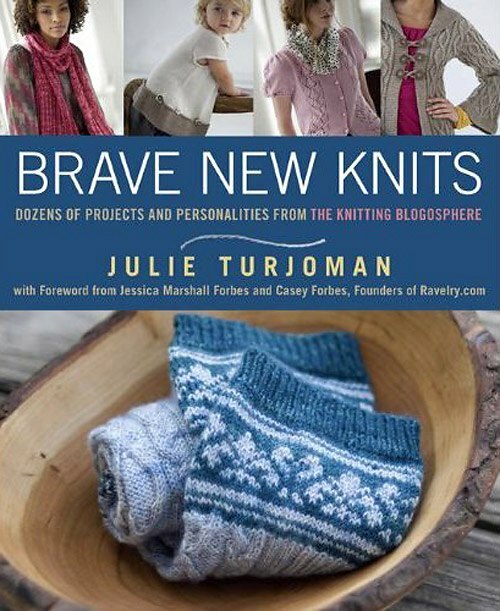 Brave New Knits by Julie Turjoman. The patterns in this book make you want to go out and buy more yarn, but that is not why i love this book. I love it because of its interviews with many of the knitwear designers/bloggers that we all know and love. Interview after interview, I am amazed and inspired by the diverse and often times contradictory backgrounds of each designer that somehow knitting has worked its way into. Each designer interview includes a pattern from the designer. This gives more depth and meaning to each pattern because after you finish reading about a designer’s approach to knitwear and their design philosophy, then you turn the page and see their ideas and concepts in full physical form waiting for you to make. The overall message in this book is how the internet- and especially Ravelry- has help to make are knitting community a little more ‘close-knit’ and has been a great platform for new designers and their work. A great book to read for anyone thinking about becoming a knitwear designer or if you just want to know how a person makes the leap from biochemisrty to sweater designer. My bi-weekly trip to the local library resulted in the find of this wonderful book- “Super Stitches Knitting” by Karen Hemingway. First of all the author’s last name is Hemingway. After reading “The Sun Also Rises”, when I was 10, I was convinced that people with the last name Hemingway must be related to Ernest and therefore are cool by association. So, the point is, that the book was cool before I even opened it. But when I did start to read it, the cool factor increased. Yes, this is yet another stitch pattern dictionary, but its not set up the way most are. Instead of endless black and white pages crammed with little window squares showing a portion of the pattern, you get the whole pattern still on the needles! That’s right, each pattern is pictured still active on the needles and in nice glossy full color. Karen uses various yarn weights and colors to help bring out each stitch pattern to its fullest. More then 300 stitch patterns are presented in this book. It’s just one of those books that you want to keep going back to when you want a clear idea of how a pattern will look on your needles before you cast on. I may actually cry a little when I have to return the book to the library. I have never been shy about my fetish for young british guys. Daniel Radcliff, Robert Pattinson. 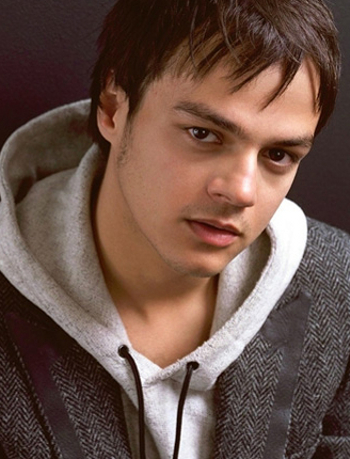 And my all-time favorite, Jamie Cullum. How serious is my addiction? I made a group on Ravelry.com dedicated to Jamie love. So, it should come as no surprise that Jamie is my prefered music to listen to when I knit. Right now, I’m collecting pictures of Jamie in knits to have record of proof for my obsession. So, if any of you happen to spot Jamie Cullum in anything that looks handknitted, please send the pic or link my way.